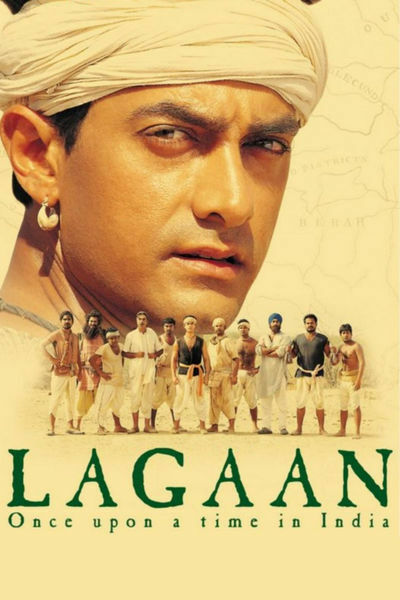 "Lagaan" is said to be the most ambitious, expensive and successful Bollywood film ever made, and has been a box-office hit all over the world. Starring Aamir Khan, who is one of the top Indian heartthrobs, it was made with an eye to overseas audiences: If "Crouching Tiger, Hidden Dragon" could break out of the martial-arts ghetto and gross $150 million, then why not a Bollywood movie for non-Indians? It has succeeded in jumping its genre; it won an Academy Award nomination this year as best foreign film, and has been rolling up amazing per-screen averages in North American theaters. The story takes place at the height of the Raj, England's government of occupation in India. In a remote province, the local British commander is Capt. Russell (Paul Blackthorne), a lip-curling rotter with a racist streak, who insults the local maharajah to his face and thinks nothing of whipping a Hindu upstart. Even his fellow officers think he's over the top. He administers "lagaan," which is the annual tax the farmers must pay to their maharajah, and he to the British. It is a time of drought and hunger, and the farmers cannot pay. Bhuvan assembles and starts to coach a local team. Elizabeth Russell (Rachel Shelley), the evil captain's sister, believes her brother's deal is unfair, and secretly sneaks out to the village to provide pointers on cricket. Her closeness to Bhuvan disturbs Gauri (Gracy Singh), a local woman who has believed since childhood that she and Bhuvan are fated to marry. There's another coil of the plot with the two-faced Lakha (Yashpal Sharma), who wants Gauri for himself, and acts as a spy for Russell because he feels that if Bhuvan loses face, he'll have a better chance with her. We meet the members of the village team, an oddly assorted group that includes a low-caste fortune-teller named Guran (Rajesh Vivek), whose crippled arm allows him to throw a wicked curve ball. There also is Deva (Pradeep Rawat), whose service in the British army has fueled his contempt for his former masters. As training proceeds in the village and the British sneer from their regimental headquarters, the action is punctuated by much music. As a backdrop to the action, there is India itself. It is a long time since I praised a movie for its landscapes; I recall "Dr. Zhivago" (1965) or "Lawrence of Arabia" (1962), and indeed like David Lean, director Ashutosh Gowariker is not shy about lingering on ancient forts and palaces, vast plains, and the birthday-cake architecture of the British Raj, so out of place and yet so serenely confident.